Phthalocyanine dye is long lasting, used by photo professionals nationwide, archives photos your entire lifetime. 24k Gold layer reflective coating, (instead of silver), protects a disc with a scratch-armor layer, other discs omit. 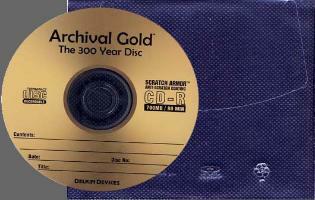 Lacquer layer over the gold prevents peeling and plastic rot – a common problem among ordinary store-discs. Diamond protective layer applied to the lacquer will prevent scratches, not found in ordinary store digital discs. condition where bubbles can form in the media (CD) due to rapid transition of temperature. Test Cell numbers are Stress Tests in an Incubation period, minimum total time, minimum equilibration duration. Equilibration is the time spent at ambient humidity before removal from the chamber. Test Cell# Test Stress # of Samples Incubation hours Minimum Total Hours Min. Equilibration hrs. Before and after, each incubation period is tested for error rates for Max-BLER for CD's and Max-PIE8 for DVD-R.
defined by the DVD Forum. Due to the length of a test, results from Test Cell number #1 is used: 80C / 85% RH. mathematical equation derived from thermodynamic laws. Archival Gold to withstand the full spectrum of light, same as the sun, for 100 continuous hours without damage. Our competitors' discs, with cyanine dye, begin to deteriorate after only 20 hours and fail at 65 hours. 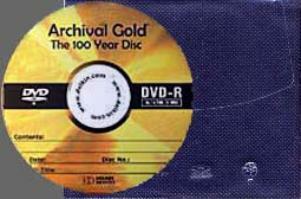 is preserved per each disc, is as tested to last from 100 years to 300 years under normal conditions.